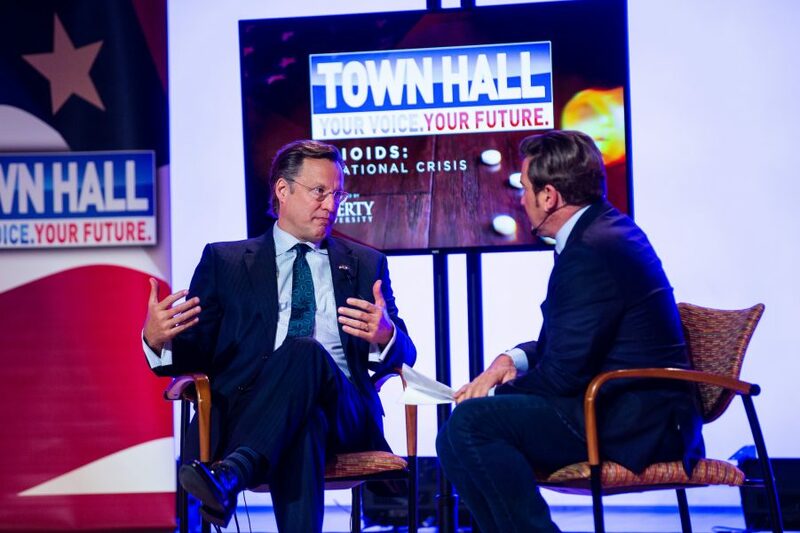 Dr. Dave Brat, Liberty University’s dean of the School of Business and former US representative, discussed the opioid epidemic during Political Commentator Eric Bolling’s “Town Hall: Your Voice Your Future” session at the University of Maryland, March 14, to a national television audience. Thursday’s Town Hall was the 9th of 14 sessions to raise awareness of the national opioid crisis, which kills 200 Americans every day on average. The national television series started at Liberty University Nov. 28 featuring a discussion panel with Jerry Falwell Jr. and First Lady of the United States Melania Trump. During his political tenure serving Virginia’s 7th congressional district (2014-2019), Brat tackled the drug crisis through the local lens, empowering the community officials wherever possible. 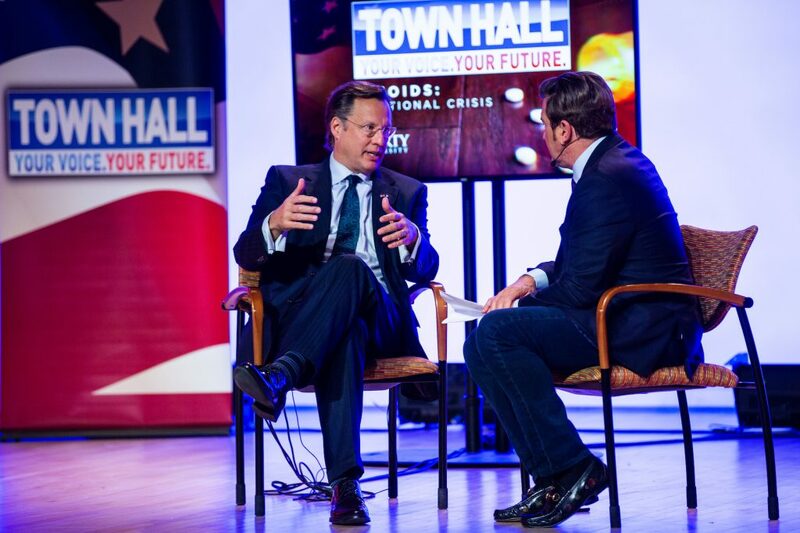 Dr. Dean Brat and Eric Bolling discuss the opioid epidemic to a national television audience. Brat was joined by Dr. Carlo DiClemente, who specializes in addiction and health behavior change, James Carrol Jr., the director of the US Office of National Drug Control Policy, and Steve Schuh, head of Maryland’s Opioid Operational Command Center. Carrol addressed President Donald Trump’s proposed wall on America’s southern border, saying it would assist law enforcement with illegal aliens entering with drugs. 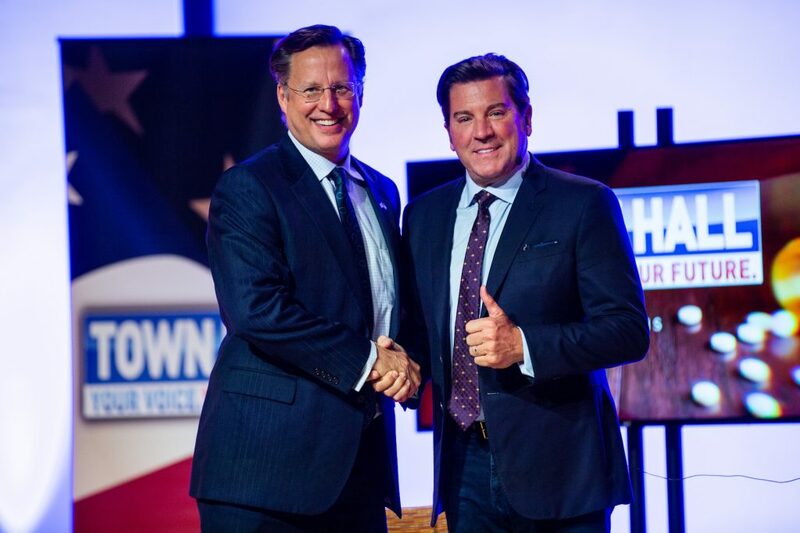 A town hall event addressing the national opioid crisis is held at the University of Baltimore featuring Dean Brat and Eric Bolling and sponsored by Liberty University on March 14, 2019. Carrol said the Trump administration is focused on strengthening the ports of entry with sufficient technologies, making admission much more difficult for drug smugglers. Bolling, the event’s moderator, experienced tragedy in 2017 when he lost his son to fentanyl, a powerful opioid drug used on patients with extreme pain. According to Nick Albaugh, the director of licensing and compliance at Amatus Health, many opioid addicts start with a simple drug like pot or marijuana before slowly developing desires for heavier substances. The marijuana community, according to Albaugh, breeds a dangerous environment for potential drug users.